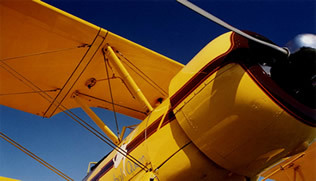 Whether it’s memory lane or the local landscape, rides in vintage aircraft offer passengers a unique perspective. It had been 60 years since Glen Jacobson was in the cockpit of a Stearman, but as the biplane cruised high above South Jersey, the trip had a feeling of familiarity. World War II ended before Jacobson, 79, of Haddonfield finished his Navy flight school, and so he only had a single session in one of the trainers. But the stick and rudder in the Cannibal Queen looked the same as when he had climbed aboard a similar plane at age 19. This summer, Biplane Rides Over Philadelphia is offering trips in the vintage plane to anyone who loves to fly and can pay the fee, which ranges from $139 for a 20-minute flight over Delaware River to $349 for a sunset flight. Two people, along with the pilot, can ride in the plane. The airplane, which regularly flies out of Northeast Philadelphia Airport, was the subject of Stephen Coont’s book by the same name. In the bestseller, the author spent three months exploring the country – he made stops in all of the lower 48 states – in the dual – wing plane. Lonergan and his crew offer several trips, including a cruise over the Philadelphia area with views of the Delaware River bridges, the battleship New Jersey, and Philadelphia City Hall. They can also cruise over Long Beach Island or Bucks County, Pa.
For Jacobson, the flight was a surprise Father’s Day gift. When they crossed the bridge into Philadelphia, he thought they were going to dinner. The experience reminded Jacobson of six decades ago, when the training field where he was based was filled with more than 100 of the yellow biplanes. They took to the sky, flying over Camden, the river, then along the Vine Street Expressway to the Art Museum. Lonergan asked if Jacobson would like to try the controls, and he took the hickory stick. “The feeling of when I took the stick and rudder was the same as it was years ago,” he said. Weather has a lot to do with when Cannibal Queen flies, said Lonergan. The plan won’t go up if the visibility is bad or the wind is blowing at more than 15 knots. Cannibal Queen was built by the Stearman Aircraft Co. and classified as a PT17, a 220-horsepower trainer for the Army and Navy. After its service career, it was used as a crop duster before it was restored in 1987. Today, the plane has been upgraded with a 300-horsepower engine, along with several modifications to its body and wheels. But it is largely the same as it was when it trolled off the Kansas assembly line. With Lonergan at the controls, he taxis the plane onto the runway and calls the tower for permission to take off. The plane lifts off, banks to the east, and heads out over the river, cruising at about 90 knots. Lonergan know the plane inside and out. The Ben Franklin Bridge gets closer, and Lonergan heads over Camden City Hall, banking west over the battleship. There are other chances to fly in vintage aircraft in the area this summer. Through July 31, Ott Clermont. Of Florida, is giving rides out of Flying W Airport in Medford aboard an AT-6 Navy trainer, which would-be WWII pilots flew after the Stearman biplane. The plane was also used to practice carrier landing. Prices range from $175 for a 15-minute sprint to $525 for an hour-long experience with aerobatics. Like the Stearman, the trainer features dual controls. About 17,000 of these planes were built in the 1930s and 1940s, with about 350 still flying. If vintage aircraft are not a draw, there are services offering trips with modern power. Moses Mosima, of Philadelphia Flight Charter, flies people to dinner in New York City on a private jet or helicopter. He also does trips for anniversaries and engagements and flies sightseeing trips over Philadelphia and New York City. Prices range from $200 to $4,500, depending on the package. “We have rides,” said Mosima, of Willow Grove, Pa. “But we also have dinner. It’s entertainment to get people away from the norm.